Exclusive Listing. Price £3750.00 + FREE Mainland UK Delivery. Comtes de Champagne Rosé Millésimé 2006 has a rich rose colour. The bubbles are extraordinarily delicate and form a wonderfully fine necklace of mousse. The nose is refined, fresh and young, revealing subtle and complex aromas of berries gently combining wild strawberries, morello cherries and blackcurrants. In the background blossoms a hint of fresh almonds and liquorice. The initial fruitiness quickly intensifies on the palate. The mid-palate is rich and structured, with a tannin tartness reminiscent of blackcurrant and red wine poached pears. The generous finish maintains balance and freshness. Still young, but already possessing great class, Comtes de Champagne Rosé Millésimé 2006 has a tannic structure that is becoming rounder and its depth and perfection are still improving. It is a wine for celebration and ceremony and is an ideal accompaniment for fruit desserts such as strawberries, Tarte Tatin or poached pears. 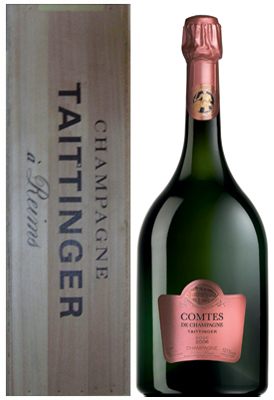 Taittinger Comtes de Champagne Rosé Millésimé 2006 is a blend of 70% Pinot Noir and 30% Chardonnay all from Grands Crus. The Pinot Noir grapes, some of which (15%) are made into red wine from the vineyards of Bouzy. The Chardonnay fruit comes from the Côte des Blancs (classed as 100% Grands Crus on the scale of Champagne crus), and gives the blend finesse and freshness. Overall, 2006 was a hot year. After a very dry autumn, the winter was cold and snowy, but fortunately there was no damage in the vineyard. The spring brought steady, mild weather, and ended with the vines flowering between 12 and 18 June. The summer was very variable, with exceptionally hot periods punctuated by numerous storms in July, followed by cooler temperatures and overcast skies in August, while September saw renewed heat and the start of a dry spell. This did not have a negative effect on the volume of the harvest. The harvest began on 7 September and was relatively spread out, in order to take into account the unevenness in the ripening. Rain arrived at the end of the harvest, but yields were high enough for us to be able to select the best grapes. The ultimate pink aperitif. Delicious with summer puddings. In order to achieve the structure and longevity so essential to this exceptional Champagne, only the juices from the first pressing are used. The wine has been aged for a minimum of 8 years in the cellars which allows the complexity of the aromas to develop and rounds off the structure of the Comtes de Champagne Rosé.